Opening Thursday February 7 from 6 – 8 pm. Exhibition continues through March 15. 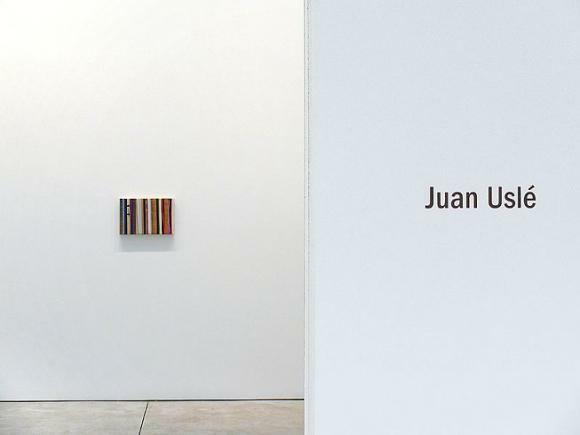 Cheim & Read is pleased to announce an exhibition of recent paintings by the Spanish artist Juan Uslé. The show is accompanied by a full color, limited edition catalogue with an essay by John Yau. Juan Uslé has been showing with Cheim & Read since 1997; his last exhibition with the gallery was in 2002. Uslé has been the subject of major retrospectives at the Centro de Arte Contemporáneo Málaga in 2007, SMAK, Ghent and the Irish Museum of Modern Art in 2004, the Museo Nacional Centro de Arte Reina Sofia in 2003, and the Instituto Valenciano de Arte Moderno in 1996. He was also included in the 2005 Venice Biennale, Documenta IX, the 1992 Istanbul Biennial and the1985 Bienal de Sao Paulo. Internationally recognized and widely exhibited, Uslé was born in Santander, Spain, in 1954 and studied art in Valencia. He now spends time in both New York City and Cantabria, not far from his childhood home. Uslé moved to New York in the late 1980s, heeding the advice and encouragement of supportive dealers and curators, and began exhibiting soon after. He arrived speaking very little English, and no prior experience with the city. The structured grid of New York, usurped by the chaos of its inhabitants, traffic and energy, was to be a huge influence on his work and is still evident in the organic geometry of his compositions. The sense of discovery that accompanies one's experience of a new and exciting place is similar to the sense of discovery one finds in Uslé's paintings. His painting process—a slow, incremental construction of color, light and space—is itself an act of discovery, a search for organized compositional elements while allowing for the emergence of the unexpected. Though abstract, Uslé's work is infiltrated with the sensation of reality, of time, space and gravity. Painting is not simply about the concepts of painting itself, but about painting as an element intrinsically connected to a larger understanding. As Uslé says, "I'm very interested in the language of painting, but to me it's extremely necessary to put in something else. It's my way of dealing with experience. What I read, what I see, what I think—all these things are in there." John Yau elaborates in his essay for the catalogue: "As usual, there are no painterly tricks and nothing fancy. At no point has the artist resorted to perspective or familiar forms of depiction. Everything is abstract and made in the most straightforward manner. The paint goes from being thinly applied, with veils of color layered together, to solid shapes, bands, and lines. One senses that the painting was built up slowly, and that the artist was led by an unpredictable combination of his imagination and memory. Choice and accident go hand in hand in Uslé's paintings, with neither being privileged over the other." For additional information please contact us by calling 212-242-7727, faxing 212-242-7737, or emailing gallery@cheimread.com.